Isocitrate lyase (ICL; EC 4.1.3.1) catalyses the first step of the glyoxylate bypass pathway, which reversibly catalysis isocitrate into succinate and glyoxylate. It is the key enzyme in the glyoxylate bypass pathway . Glyoxylate shunt was reported to be pivotal for microbes to survive and thrive on the fatty acid and two-carbon compound as sole carbon source . ICL existed extensively in organisms such as bacteria, nematodes, fungi and plants . No human being homologs have been documented . This made ICL a promising target for broad spectrum antibiotics. ICL is essential for Mycobacterium tuberculosis growth in activated macrophages and persistence in macrophages and mice , and virulence factors of Candida albicans, Rhodococcus equi [5-7]. ICL was intensively pursued as drug target to combat tuberculosis. Tuberculosis was once held at bay by the introduction of antibiotics and there was a widespread optimism that it is just a matter of time to eradicate them. However, several factors, including the emergence of drug resistance, multi-drug resistance and even extensive resistance, co-infection with HIV and poor compliance of patients largely due to the lengthy treatment regimen, result in the re-establishment of tuberculosis as a major scourge of public health. And this once optimism was relentlessly pulverized. Intense investigations on ICL inhibitor have revealed variety of drug leads promising to proceed into next stage. Many have put on a premium on ICL as a priority target,such as WHO (World Health Organization) , GSK and Rockefeller University. ICL expression was reported to be highly spatiotemporal and conventionalscreening might miss some promising leads . Β-amino ketones are the key intermediates for the synthesis of lots of drugs and natural products, and are also important bioactive substances , with function of anti-inflammatory [13, 14], anti-cancer [15-18], anti-bacterial [18, 19], anti-virus, sedation, analgesia, hypotension, edema suppression and anti-coagulation. more diverse activities were reported, such as: anti-androgen, insulin sensitizer, excited peroxisome proliferator-activated receptors (PPARs), inhibit cholesterol acyltransferase (ACAT), and promote high-density lipoprotein receptor (SRBI) expression and reverse tumor multi-drug resistance, such as pharmacological activity, can be used as the prevention and treatment of insulin resistance-related diseases, diabetes, obesity, atherosclerosis, fatty liver, hyperlipidemia, inflammation, tumor diseases, such as multi-drug resistance of the drug/precursor material [21-24]. Our working hypothesis is these compounds might be active against ICL. A previously proved high-throughput screening model for ICL inhibitors in our lab  was employed to screen new ICL inhibitors from the mannich base compounds library. Compound Ydcm67 (Fig.1) demonstrated a strong inhibitory activity to ICL. Mycobacterium tuberculosis H37Rv was purchased from Chongqing Pulmonary Hospital, China; Escherichia coli DH5α, E. coli DE3 (BL21) and plasmid pET-28a (+) were employed; Pfu DNA Polymerase, DNA marker were purchased from Tiangen Biotech (Beijing) Co.,Ltd; DNA purification kit was purchased from SBS Genetech Co., Ltd; BamHI, HindIII, T4 DNA ligase, and dNTP were purchased from Takara; Ni-Sepharose and ȀKTA prime were from Amersham Biosciences. Isocitrate and itaconic anhydrate were obtained from Sigma-Aldrich. The mannich base compounds library was constructed by Pro. Dacheng Yang's lab, School of Chemistry and Chemical Engineering, Southwest University, China. The 96-well plate for UV assay was purchased from Greiner. Absorbance was read at 324nm on SpectraMaxs 190 (Molecular Devices, Sunnyvale, CA). The genomic DNA was prepared using CTAB. A 1.3-kb DNA fragment containing the aceA gene was amplified by nested PCR using the following four oligonucleotide primers: OutF: 5' CGC CTC GCT GTT GAA TCT GT 3' and OutR: 5' CGC TCA CTG TTC CTC CTC AAA T 3' for first PCR; ICLF: 5' TA GGA TCC ATG TCT GTC GTC GGC AC 3' and ICLR: 5' TCA AAG CTT CTA GTG GAA CTG GCC CTC T 3' (restriction sites are indicated with single underlines) for second PCR. The amplified DNA was digested using BamHI and HindIII, and ligated into pET-28a (+), then the recombinant plasmid pET28a-ICL was transformed into E. coli DH5α. The nucleotide sequence was done on an ABI 3730 sequencer. For over-expression, E. coli DE3 (BL21) carrying the recombinant plasmid pET28a-ICL was grown to an exponential phase at 37℃ in Luria-Bertani (LB) medium  plus kanamycin (50 μg ml-1). Expression of ICL was induced by 0.1mM IPTG for 4h at 30℃. Cells were harvested by centrifugation at 4℃, and cell pellets were stored at -20℃. Using Buffer A (50mM NaH2PO4, 300mM NaCl, 10mM imidazole, pH 8.0) as the lysis buffer, and the lysate was centrifuged at 13,000 g for 30 min at 4℃. The cell extract was applied to Ni-sepharose (Amersham Biosciences) and fractions with ICL activity were collected and stored at 4℃ for 2 months with no loss of activity. Isocitrate lyase activity was determined at 37℃ by measuring the formation of glyoxylate-phenylhydrazone in the presence of phenylhydrazine and isocitrate lyase at 324nm based on the method described . The reaction buffer include 50 mM potassium phosphate, 4 mM MgCl2, 4 mM Phenylhydrazine HCl, 12 mM Cysteine HCl, pH 7.0, and it was kept on ice until use. The mixture of 188 μl reaction buffer and 2 μl recombinant ICL solution was incubated at 37℃ for 30 min, and the change of absorbance at 324nm was measured after the addition of 10 μl isocitrate. The Km and Vmax was gained using the Hanes-Woolf plot , with the slope = 1/Vmax and the intercept on the x axis = -Km. The mixture of reaction buffer and different unit enzyme was incubated at 37℃ for 30 min, and absorbance at 324nm was read as control values. Then isocitrate was added, and the plate was incubated at 37℃. The absorbance at 324nm was read as experimental values every 10 min for 5 times. The mannich base compounds were dissolved in DMSO to obtain final concentrations of 1.0 mg/ml, and stored at -20℃. The test mannich base solutions were diluted on the mother plate (1.0 mg/ml in 100% DMSO), and 10 μl of each extract solution was added into each well (equivalent to a final concentration of 0.05 mg/ml) of a 96-well plate. The A1, B1, and C1 represent the background, negative control and positive control (0.05 M oxalic acid) respectively. Subsequently, 178 μl reaction buffer, 10 μl compound solution, 2 μl recombinant protein ICL solution, and 10 μl isocitrate solution (0.04 M) was added to each well, and the absorbance was measured as described above. The inhibition >50% of extracts were picked up for the following screen to reconfirm the inhibition, and the screen assay was done in duplicate. To determine the IC50, five concentrations were used. The activity detection of ICL was based on the absorbance at 324 nm, and the activity was calculated by the change of absorbance (experimental values control values). The signal to noise (S/N) and screening window coefficients (Z' factor) were calculated as described by Zhang, et al to evaluate the suitability of the model for screening. Data that were detected from eight wells have been used to calculate the S/N and Z' factor. 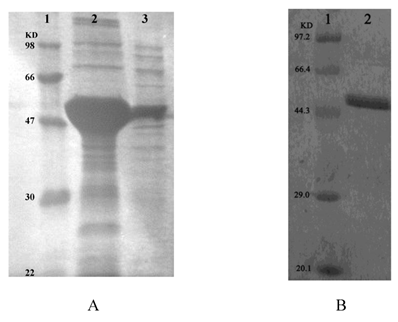 Recombinant plasmid was isolated from clones growing on LB medium supplement with kanamycin (50 μg ml-1), and found to contain an intact copy of the 1.3-kb DNA by two enzymes digestion (Fig.2). The sequence result showed that no mutations were discovered, confirming the construction of recombinant plasmid pET28a-ICL. 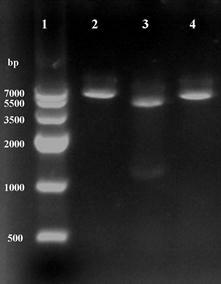 Using restriction enzymes digest recombinant plasmid pET28a-ICL. Lane 1: Marker IV; Lane 2 and 4: BamHI and HindIII single digestion; Lane 3: BamHI and HindIII double digestion. Recombinant ICL was overexpressed in E. coli DE3 (BL21). Using SDS-PAGE analysis of recombinant ICL in the inclusion body and supernatant (Fig.3A). Than using ÄKTA prime (Amersham Biosciences, USA) purified recombinant ICL protein (Fig.3B). A: SDS-PAGE analysis of recombinant ICL in the inclusion body and supernatant. Lane 1: Protein marker; Lane 2-3: Precipitate and supernatant of sonicated broken E.coli DE3 (BL21) transformed with pET28a-ICL, respectively. B: SDS-PAGE analysis of recombinant ICL that purified. Lane 1: Protein marker; Lane 2: Purified protein. The recombinant enzyme activity was 21,500 U/L. Using the Hanes-Woolf plot, the Km and Vmax were determined to be 219 mM and 3.127 mM/min/mg, respectively. 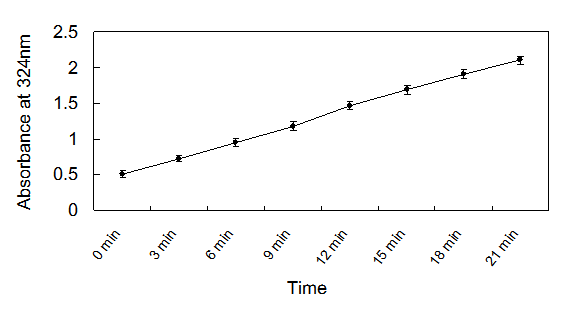 The results showed that the production of glyoxylate-phenylhydrazone was linear with the time of incubation up to 20 min (Fig.4) and with the amount of protein in the assay at 2mM concentration of isocitrate. Therefore, the optimized condition of ICL for assay was fixed at 2μl enzyme solution (approximately equal to 215 U/L) in each well, and an incubation time of 20 min at 37℃ was used. 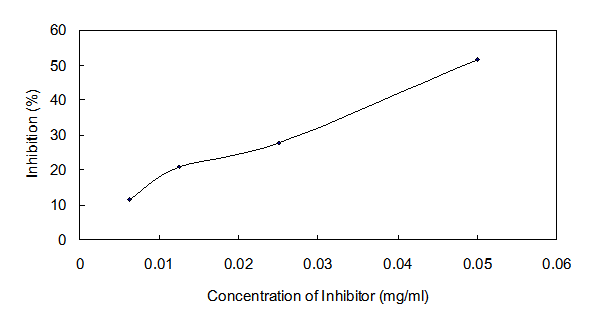 The IC50 value of oxalic acid to ICL was 0.013 M determined over a range of inhibitors' final concentrations (0.005 M - 0.05 M) under the optimized conditions (Fig.5). Isocitrate lyase activity as determined by the assay as a function of time. As described in Materials and Methods, the signal to noise (S/N) and Z' factor was calculated from the control wells of screening plates to determine the suitability of the assay for high throughput screening. The Z' factor reflects the dynamic range as well as the variation of the assay and is a useful tool for assay comparisons and assay quality determinations. The assay exhibits S/N of 650.6990 and Z' factor of 0.8141 (Table 1). d and e: the S/N and Z` factor were calculated by the equations: (M Signal-M Background)/SD Background; 1-[(3×SD Positive Control) + (3×SD Negative Control)/(mean positive control-mean negative control)], respectively. In this assay, 124 mannich base compounds were tested. All compounds were evaluated in the assay at a final concentration of 0.05 mg/ml. Inhibition of more than 50% was defined as a hit. We found Ydcm67 has a significant inhibitory activity (Table 2). The IC50 value of Ydcm67 to ICL was 0.0535 mg/ml determined over a range of inhibitors' final concentrations (0.0063 mg/ml - 0.05 mg/ml) under the optimized conditions (Fig.6). To accommodate the assay described to HTS, the optimization of the assay was performed. The incubation time was changed to 30 min to make full interaction between enzyme and inhibitors, and the changeable values of the absorbance at 324nm in 20 min was used to represent the activity of the ICL. Additionally, 2 mM isocitrate and 0.043U ICL at a final concentration were used in the assay. 124 mannich bases were screened in this assay, and one of them, Ydcm67, exhibited the inhibition of ICL activity, the IC50 value of Ydcm67 to ICL was 0.0535 mg/ml, and resulting in a total hit rate of 0.81%. Typically, Z' factor >0.5 and S/N >10 are considered favorable for high throughput screening. Our assay exhibiting S/N of 650.6990 and Z' factor of 0.8141 and the reproducibility of positive compounds indicates that it is suitable for high-throughput screening. 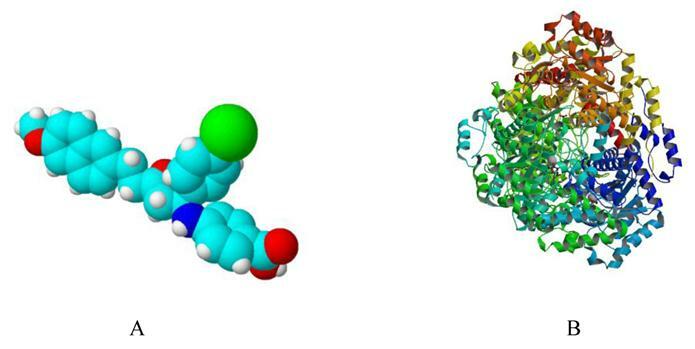 Simulated 3D structure of Ycdm67 (Fig.7A) generated via ChemSketch demonstrates that this molecule might function by wedging in the active site of ICL (Fig.7B). This is the first report that a high-throughput screening assay was developed to screen the mannich base, and one hit is active against ICL. However, in vivo data are needed to evaluate the compound's efficacy and provide structure-activity relationship information. A: The 3D structure of Ydcm67 (White: H; Lightcyan: C; Red: O; Mazarine: N; Green:Cl). B: The crystal structure of isocitrate lyase from Mycobacterium tuberculosis (http://www.rcsb.org/pdb/explore/images.do?structureId=1F8I). This work was supported by the National Key Infectious Disease Project (Grant Nos. 2008ZX10003-006); Excellent PhD Thesis Fellowship of Southwest University (Grant Nos. kb2009010, ky2009009 and kb2010017); Fundamental Research Funds for the Central Universities (Grant No. XDJK2009A003); National Natural Science Foundation (Grant No. 81071316) and Natural Science Foundation Project of CQ CSTC (Grant No. CSTC, 2010BB5002).